This is a genuinely eerie adaptation of Osbert Sitwell's novel about strange happenings in an English country house. Former cameraman turned director Bernard Knowles knows just how to achieve the right spine-chilling touch, cleverly keeping the supernatural themes light in tone. 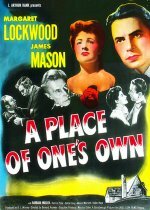 The cast is delightful, with James Mason and Barbara Mullen as the retired homeowners, and lovely Margaret Lockwood as their companion who is the catalyst for the ghostly goings-on. Bride of Frankenstein veteran Ernest Thesiger steals the show as old Dr Marsham, who isn't exactly what he appears, and there's nice support from Dennis Price and Dulcie Gray, too. Time has lent this Gainsborough picture a veneer of charm and it's well worth watching.